The Asper Centre’s Immigration & Refugee Law Student Working Group is honoured to host Senator Ratna Omidvar for a lunchtime seminar on Wednesday March 7, 2018 at 12h30. All students are welcome and encouraged to attend. 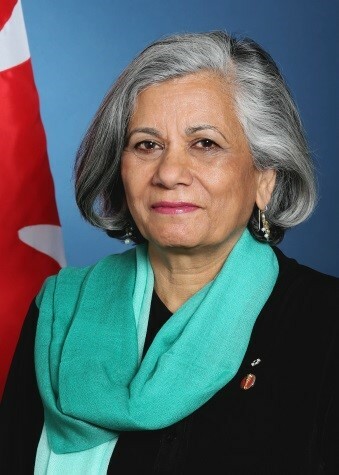 Senator Omidvar will share her personal story of coming to Canada from India, and she will discuss issues related to inclusion and diversity in Canada, immigration and refugee law and policy, the Charter and progressive law reform. She will then take questions from the audience. This will be a great opportunity to get some insight from her inspiring career. Email tal.schreier@utoronto.ca for further information. Senator Omidvar is the founding Executive Director and currently a Distinguished Visiting Professor at the Global Diversity Exchange (GDX), Ted Rogers School of Management, Ryerson University. GDX is a think-and-do tank on diversity, migration and inclusion that connects local experience and ideas with global networks. Previously, Senator Omidvar was the President of Maytree, where she played a lead role in local, national and international efforts to promote the integration of immigrants. Senator Omidvar is the current Co-Chair of the Global Future Council on Migration hosted by the World Economic Forum and serves as a Councillor on the World Refugee Council. She is also a director at the Environics Institute, and Samara Canada. Senator Omidvar is the Toronto Region Immigrant Employment Council’s Chair Emerita and was formerly the Chair of Lifeline Syria. Senator Omidvar is co-author of Flight and Freedom: Stories of Escape to Canada (2015), an Open Book Toronto best book of 2015 and one of the Toronto Star‘s top five good reads from Word on the Street. She is also a contributor to The Harper Factor (2016) and co-editor of Five Good Ideas: Practical Strategies for Non-Profit Success (2011). Senator Omidvar received an Honorary Degree, Doctor of Laws, York University in 2012.